Passengers from Manchester were held at Prague airport after a drawing of a bomb was found on a piece of paper in the toilets. Jet 2 flight from Manchester to the Czech capital landed at around 6.30pm local time last night. 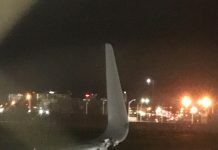 The 183 people on board were evacuated from the aircraft but then held at the terminal building after they were told a ‘threatening note’ had been found. The officials in the Czech Republic have said it was a drawing of a bomb found in the toilets which sparked the scare. The flight attendant found a paper on the toilet on the plane, on which a bomb was painted, so the captain informed the control tower. Staff were also searched as part of the big police operation as well as passengers on some other flights arriving into Václav Havel Airport, Novinky said before everyone was allowed to leave around 10:30pm. The aircraft was grounded for around four hours while police checked through cabin baggage and interviewed passengers. In a tweet, officials from Prague Airport confirmed that the disruption is due to a potential bomb threat.